When you leave a beautiful place, you carry it with you wherever you go~~~copied 🙂 . Now, this is what happened after I visited the Seychelles. This has been one of my dream places to visit and the day arrived soon in the month of January 2018. I along with my husband boarded the Etihad flight from Mumbai to Mahe (the capital of Seychelles) via Abu Dhabi. It was quite a long journey of 10 hours with the stopover. So, I would suggest booking direct flights to Seychelles from Mumbai which takes around 4 hours. 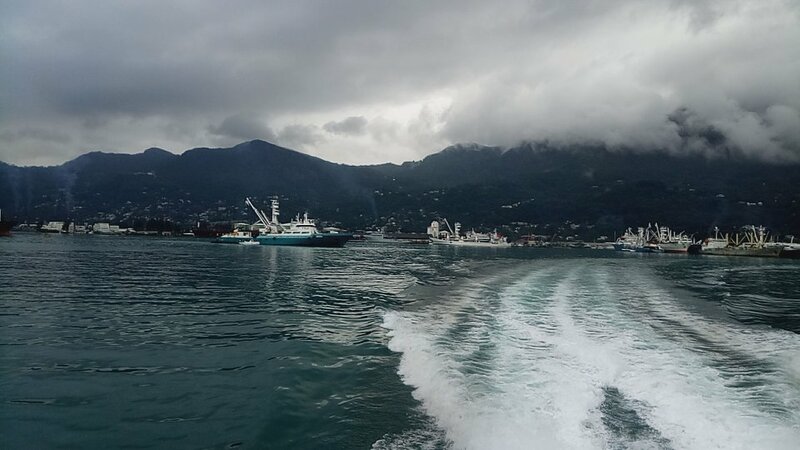 But all my fatigue vanished the moment I was nearing the mainland of the largest island Mahé in the archipelago of Seychelles. What breathtaking scenery it was with the sea on one side and the high hills on the other 🙂 . The airport of Mahé is the cutest airport I have ever seen. The immigration was very smooth with only stamping of the Coco de Mer (What is it?? You will get to know soon) on your passport and allowing you a permit to stay in beautiful Seychelles for the next 30 days. So, it’s like Visa-free for Indians. We booked our stay with Kempinski Seychelles Resort, which was located towards the south of Mahé, around 18km from the airport. The tour operator arranged for the pick up from the airport, so it was hassle free, though it took us some time to figure out where the car was parked. The journey from the airport to the hotel was quite splendid, with little shops and houses by the side of the main road and greenery all around. It gave me the feeling of some dainty place with the man with his little house and a sea to relax when desired. Wish life was such every day! The entrance to our stay was quite amazing too, with the main road lined with trees and bushes. 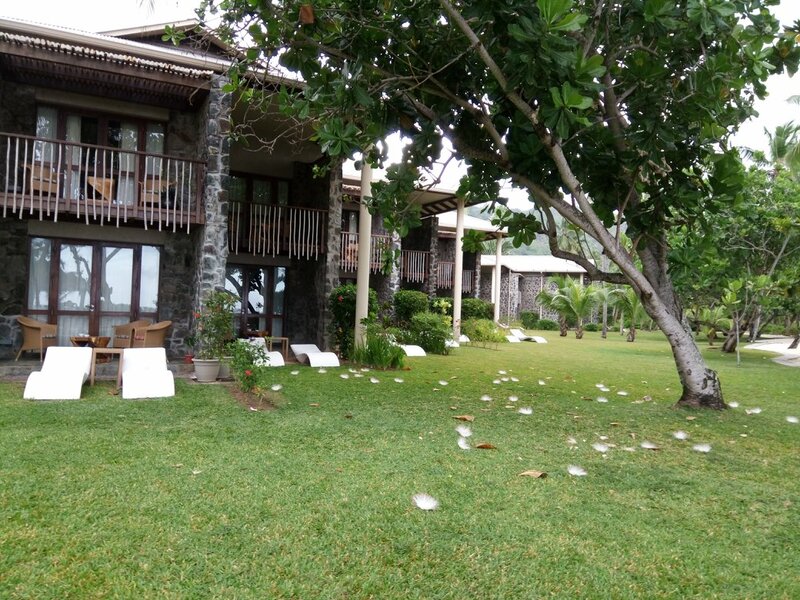 Kempinski has a private beach and also its very own hilltop overlooking the entire property. We checked into our room and relaxed at the beach for quite some time. It was so so soothing to be at such a place and watch a beautiful sunset. The day was quite hectic with two flights, so we had early dinner and retired for the day. 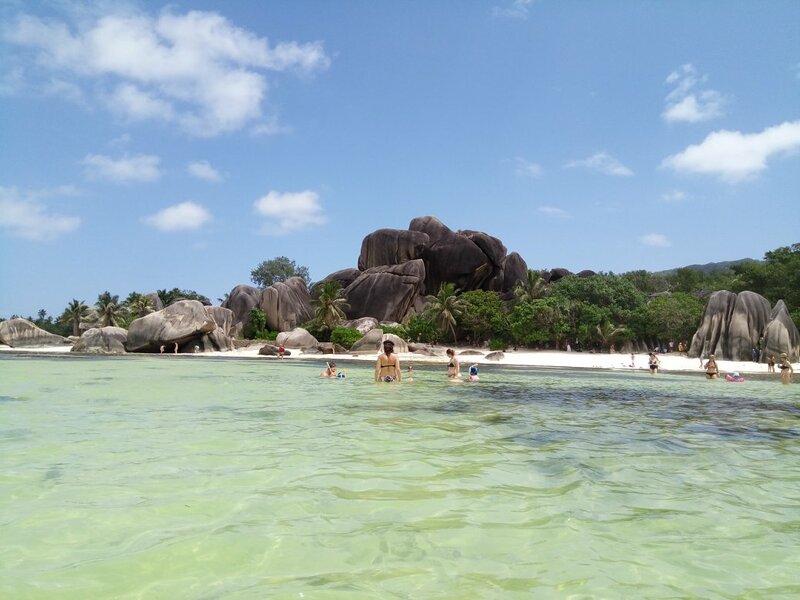 A day later we decided to go on the island hopping tour to two of the prettiest islands of Seychelles-Praslin & La Digue. It was not in the itinerary at the beginning, but we thought coming to Seychelles & missing this part will not be great. 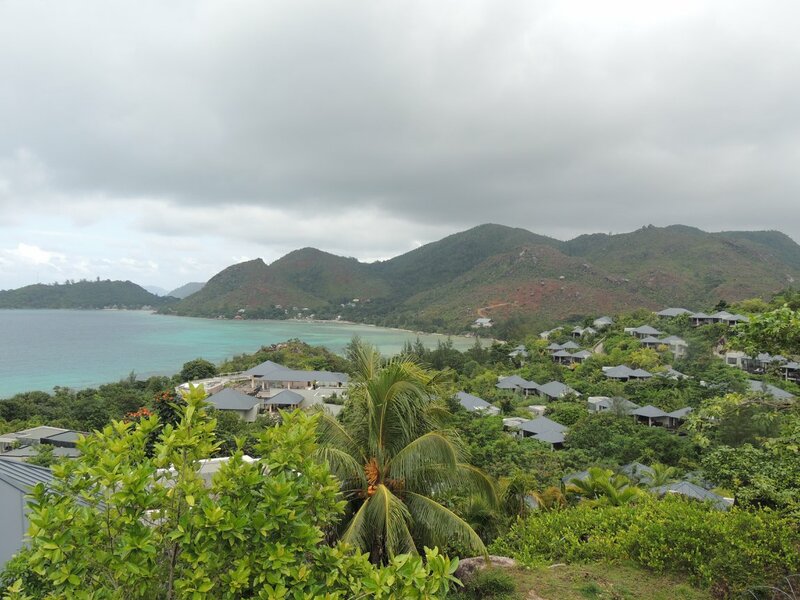 Our tour was arranged by 7° South, who are experienced in this area for quite a long time, and I would highly recommend booking their tours if somebody visits Seychelles. The cost of the tours in Seychelles is quite high but still, everything was worth it. We started off from our hotel quite early on the day of the tour, like 6 o’clock in the morning. The hotel arranges early breakfast for its guests who are leaving for such tours. So I found it quite appreciable. The cab picked us up from the hotel and dropped off at the Inter Island Quay, Victoria from where we had to board the ferry to Praslin. That day, there was a downpour early in the morning and it was still drizzling when we arrived at the jetty. I was praying hard so that we can have a sunny day to enjoy the most. No sooner we boarded the Cat Cocos ferry and travelling a few miles, it was bright and sunny 🙂 . 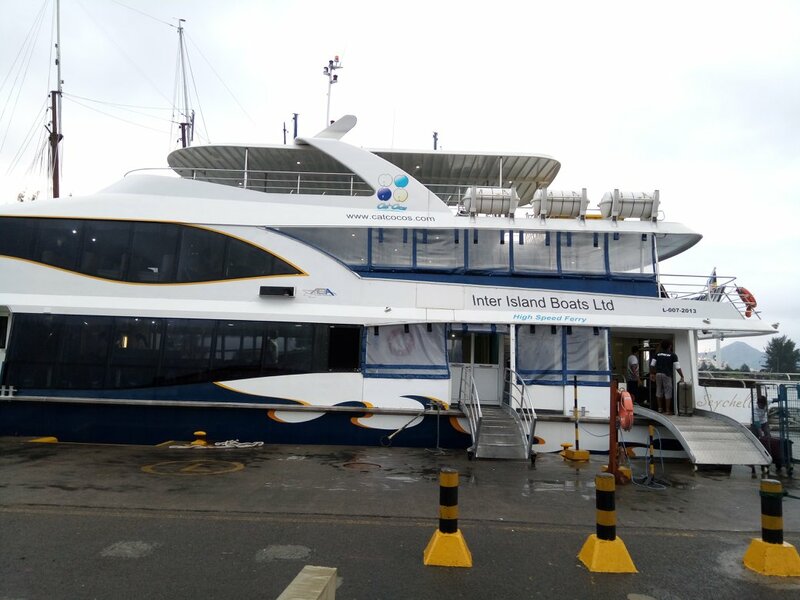 There are many ferries operating between the islands and I am attaching the Cat Cocos schedule here. It took us about 1 hour to reach the Praslin jetty and we were immediately transferred to a ferry for La Digue. The journey took about 20 mins. La Digue is the fourth largest island in Seychelles, with a population of less than 3000, can you imagine!! It is famous for having the most photographed beach in the world ‘Anse Source d’Argent’ and I was too much excited about it. So now from a ferry, we got into an open truck to travel to our next spot, the L’Unioin estate which houses the Coconut and Vanilla plantations and our tour guide explained the whole processes of coconut oil production so nicely. 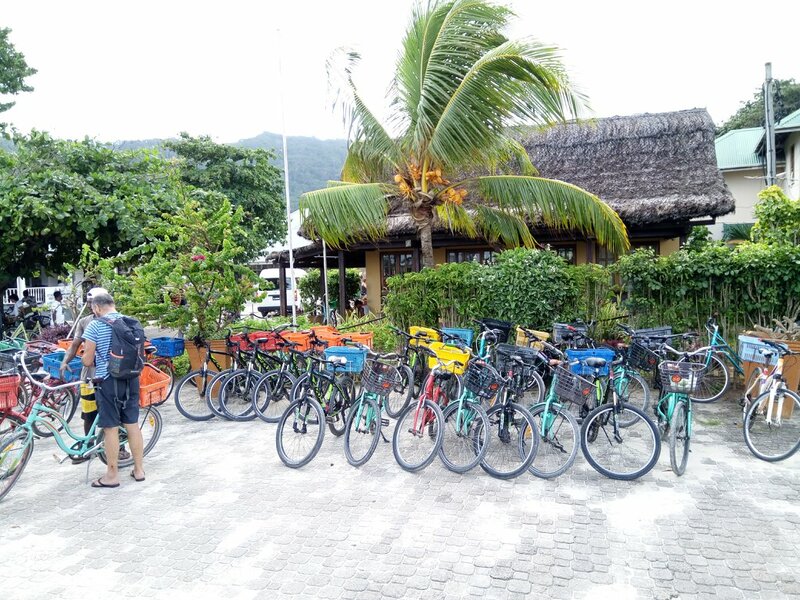 There are also cycles for hire to explore the island on your own. I really wanted to try that, but since we were booked in the tour, that option was not there. 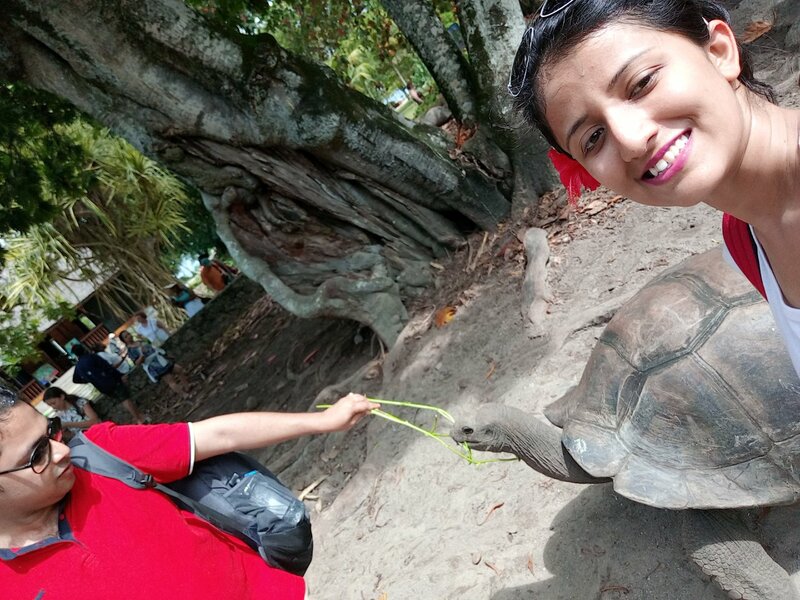 The estate also has an enclosure of the Giant Aldabra tortoises, which are the largest in the world. And the good thing is that you can meet them in close proximity and feed them and they don’t seem to mind at all. After this comes the main attraction of La Digue I was waiting for, ever since we booked our trip. 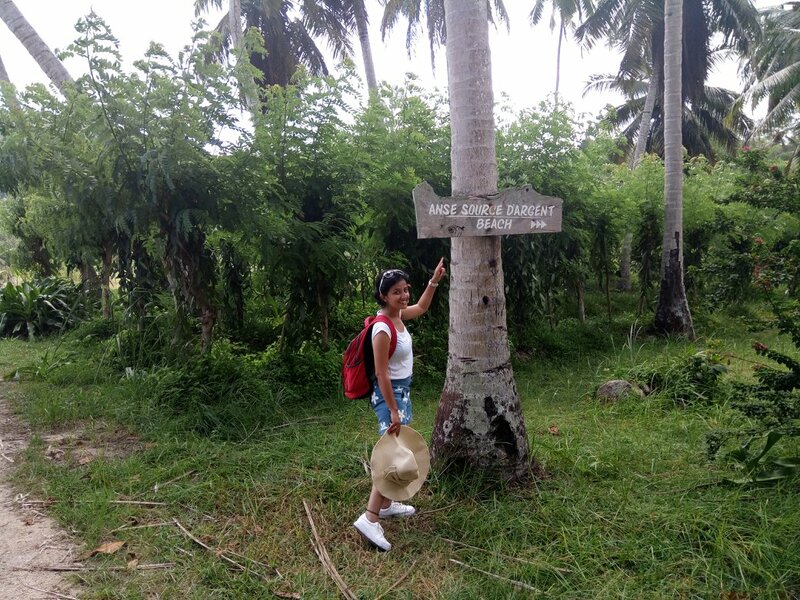 It is a small walk through the vanilla plantations to reach the entrance of the beach of Anse Source d’Argent. There is a small cafe at the entrance where you can buy snacks and drinks, just be careful not to litter around. The walk after the cafe begins through some granite rocks giving fleeting glimpses of the beach and after 100-150 steps I am there finally at the most beautiful beach ever. I think after this no beach would be good enough to impress me a bit. The clear waters, blue skies above and the big granite rocks surrounding the beach was a sight to behold. You can spend the entire day lazying on the beach and gazing at the horizon. At that time of the year, the waves are subsided at the shore, so one can easily do swimming and snorkelling. The gears are also available at the only shop at the beach. I too tried some snorkelling and got to see some fishes 🙂 . After the beachy first half, we headed to the jetty to board our ferry back to Praslin. 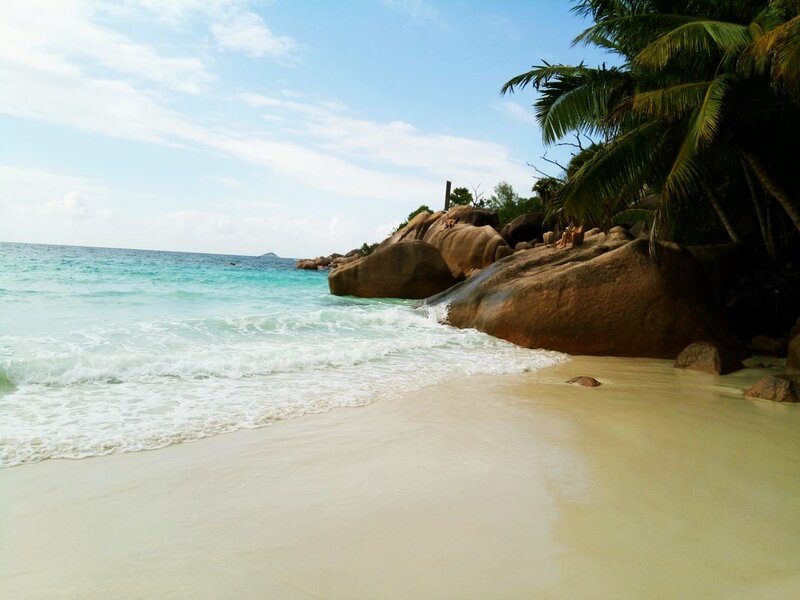 Praslin is the second largest island in Seychelles with lots of beautiful resorts and sightseeing options like the Vallée de Mai Natural Reserve and Anse Lazio beach. But before that some respite to the tummy, which was so famished after all the day’s exploration 😛 . So after reaching Praslin, we first halted at a quaint restaurant to have buffet lunch which consisted of Creole cuisine. It tasted quite good. 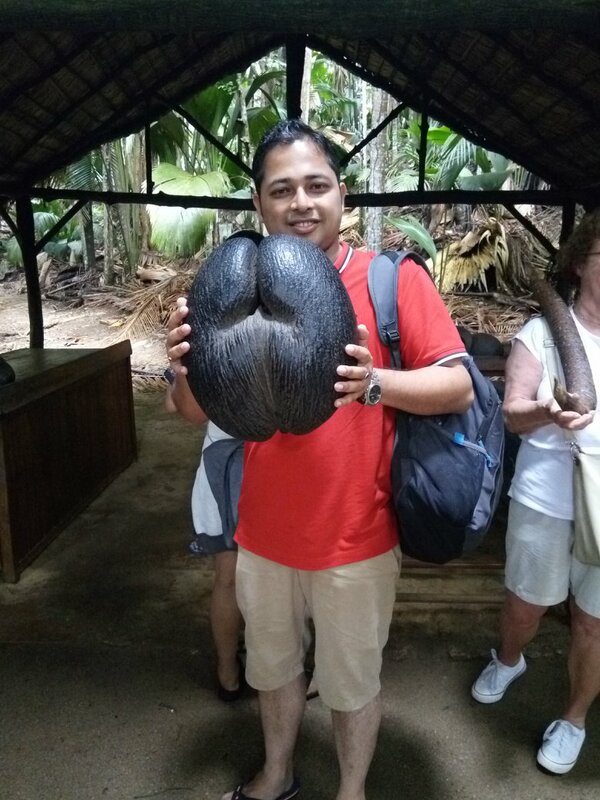 Now, next stop was the Vallee de Mai reserve which houses the Coco de Mer, the largest nut in the world. It is illegal to carry the Coco de Mer out of Seychelles without written documentation and if you are found guilty, you might very well end up in jail. This single nut costs a whopping $350 …and my eyes were popping out at that time. 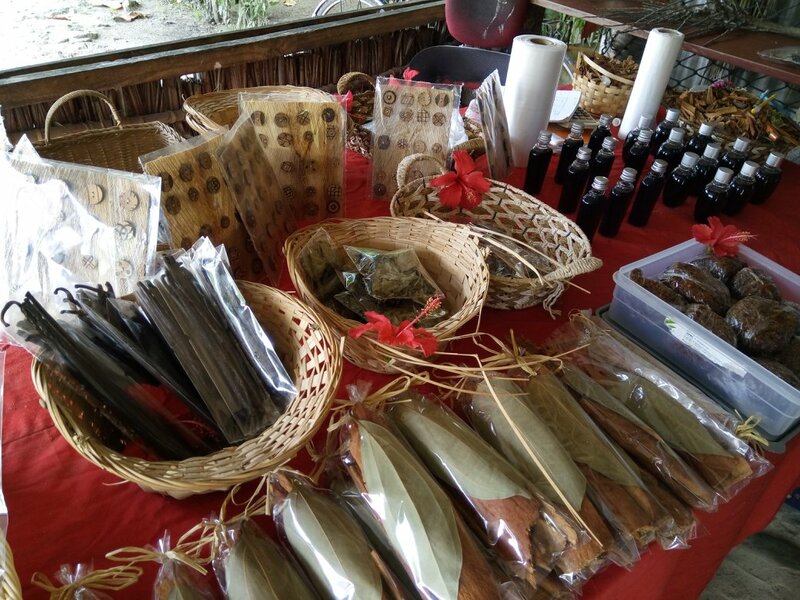 It was a wonderful experience to visit this world heritage site and get an insight into the plantation of these endemic species. The final stop for the day was yet again another beautiful beach called the Anse Lazio on the island of Praslin. It had clear waters with a beautiful sunset view, but a bit more crowded than the Anse Source d’Argent. The late afternoon was spent strolling on the beach side and clicking photos 🙂 . At around 5o’clock in the evening we boarded our ferry back to the mainland with beautiful memories of two of the most charming islands 🙂 . Until next time….Happy & safe travelling to all! 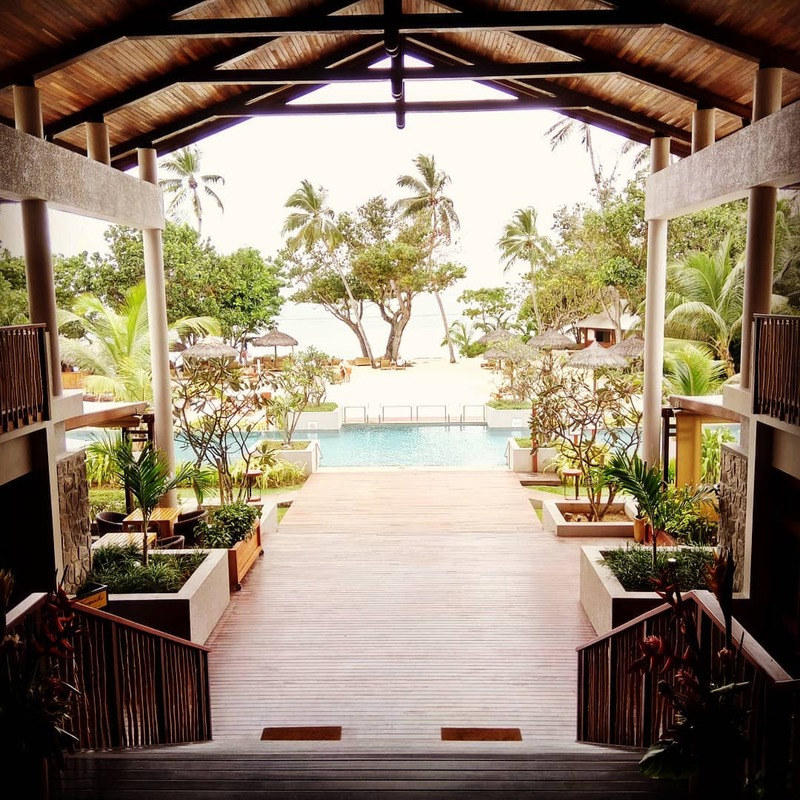 There are many hotels, guest houses and chalets available in Seychelles of all budgets at convenient locations (Beau Vallon, Anse Royale) which can be easily booked via any hotel booking website. 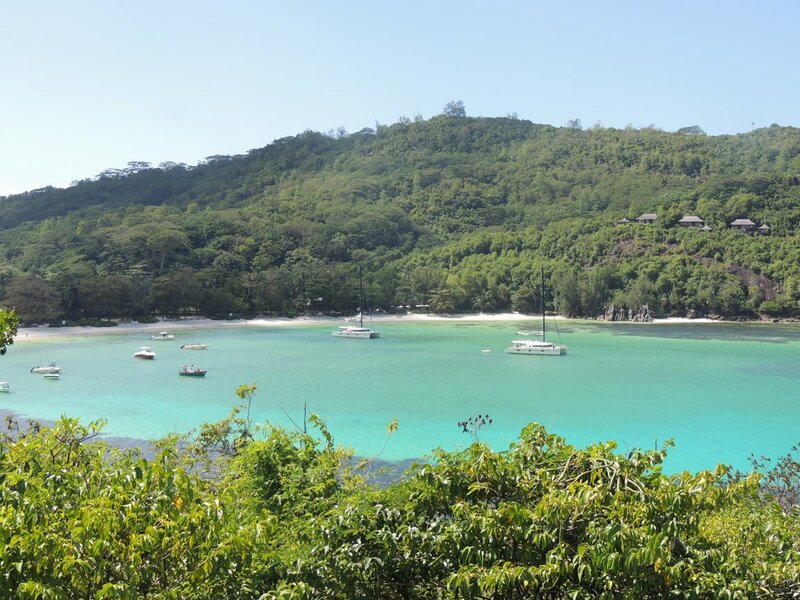 From our experience, I would suggest staying near Victoria around Beau Vallon beach area if you want a city feeling, else south Mahe beaches are perfect for some alone time and are quite relaxing.